Why can’t I just be happy? It seems like my state is an involuntary cage from which I can’t escape. Does that resonate? 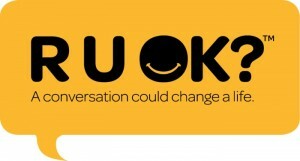 Yesterday was National R U OK Day. It sought to highlight that many of us (particularly men) wear masks. We feel an incredibility strong and peer pressure need to show a veneer of stability and masculinity, yet we are crying out for understanding and security on the inside. For Christian men, the mask is particularly strong. Not only do we content with society pressure of expectations, but the Christian culture says that because we follow Christ and he is our security, to feel insecure is not only weak, but also sinful. Yes, man in inherently sinful and our lack of trust in Jesus for our security is sin, but I don’t think we can say that stress, anxiety and depression are sinful acts. They are effects and results of living in the fallen world. The sad part is that our stress anxiety and depression can be drivers to other sins as we seek escapism in fantasy, drugs, and other numbing agents outside of Christ. We as believers are instructed to give encouragement to one another. That encouragement must take the form of helping each other focus on Jesus daily and hourly in an uncomdemning manner. For we are all sinners – more than we realise. Externally speaking, I have no reason to be stressed or anxious or insecure, but I struggle with these regularly and more that I care to admit (as I am sure most of us do if we are honest). The antidote is in the above verse. Be thankful. It costs nothing and the health benefits are out of this world (metaphorically and literally). Let’s not just let the Americans have one day of thanksgiving per year. As Christians everyday and every hour must be a day of thanksgiving. Let’s start now by thanking God and requesting our needs from Him. Let’s trust him to help us manage our anxiety and fears.